Apple has rejected an application that quacks on the grounds that it's pointless, apparently failing to notice the true value of what fills the iTunes store. Atlantia Software developed the QuackPhone application, which was rejected by Apple because it "contains minimal user functionality" as explained in the email sent to the developer and passed on to CrunchGear. But there's better news for those who like to see real breasts wobbling, as the publishers of "Wobble" have discovered some of the unpublished rules and modified their application to fit in with them. Quite why a "quack" would be unacceptable when a fart is OK isn't clear, but Apple's approval process is the very definition of opaque. It's been suggested that if QuackPhone could produce a range of different quacks then it might slip though, though that would just make Apple's rules even more arcane. 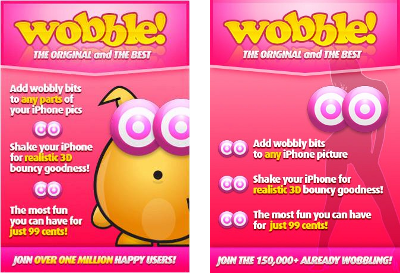 But Jon Atherton, author of the Wobble application that allows users to make parts of a photograph wobble (clearly providing vital functionality), has been on the phone to Cupertino and got some hard rules out of them, enabling him to modify his application and get back into the iTunes store. New version on the left - the one on the right is "sexually arousing"
So, it's no bikinis (on men or women) and no ice-skating tights on women (Mr Atherton didn't ask about tights on men), no innuendo, nothing sexually arousing and no implied sexual content. Except if you're a big brand, obviously, then you can just carry on as normal.